The joy and excitement of bringing new life into the world has inspired us to explore and discover better ways of serving you and our young patients. Thomson ParentCraft services are designed as part of our ongoing efforts to help expectant and new mothers enjoy their experience during pregnancy and after delivery. We believe that maids or caregivers should be equipped with the knowledge adn skills necessary to provide proper care for the baby. This would increase their confidence in looking after the baby and also serve to increase the confidence of the parents in entrusting their baby to their care. With this in mind, TMC has developed an infant care programme with the aim of equipping the maid or caregiver with the knowledge and skills to care for the baby. Training is conducted on weekdays. Duration: 1hr 15min. One-to-one training is also available by appointment. Breastfeeding has always been close to the hearts at Thomson. Breastfeeding has so many health benefits for mother and child that it is not surprising that most modern, well-informed mothers today, opt for total breastfeeding. However, the unfortunate fact is that although it seems so natural to breastfeed, the ability to do it successfully does not necessarily come naturally. At Thomson ParentCraft, our lactation consultants have been offering individual specialised counseling to breastfeeding mothers either on an outpatient basis or in the comfort of our patient’s home. Touch is the physical expression of love and it is especially critical for babies. Baby massage aims to encourage parent-child bonding and encourage body awareness, coordination and motor development. Massage can also alleviate infant gas and colic and help calm your baby, promoting a more peaceful sleep. Conducted by our experienced ParentCraft specialists, parents will learn all the necessary skills required to give their baby massages at home. The programme also teaches about motor developmental milestones in a child and how to modify massage techniques at various stages of growth. Here at TMC, we emphasize small class structure for a more personalized coaching. The baby should preferably be between 1-9 months old. Learn how to introduce solids to your baby in a fun way and minimise tears and struggles during this transition period. There will be a lecture by a doctor or specialist on this topic, as well as step-by-step coaching sessions to equip yourself with the necessary skills. This programme is to provide professional homecare services to give early discharged mothers continual support and care in the comfort of their own home. The aim of this programme is to increase the mother’s self-confidence and enjoyment of the new baby, and to impart practical knowledge and skills on the day-today care of the newborn. HypnoBirthing is as much a philosophy of birth as it is a technique for achieving a satisfying, relaxing and stress-free method of birthing. This amazing program based on Mongan's method teaches you, along with your birthing companion, the art and joy of experiencing birth in a more comfortable manner. You will learn how to call upon your body's own natural relaxant and thus lessen, or even eliminate, discomfort and the need for medication. When a woman is properly prepared for childbirth and when mind and body are in harmony, nature is free to function in the same well-designed manner that it does with all animal mothers in nature. Classes are only taught by qualified hypnobirthing practitioners. Mishaps sometimes happen and they strike us when we least expect them to! The First Aid Training Program by Thomson Medical Centre teaches you how to deal with an accident at home or in school. With this programme, you will be taught the safety measures at home and how to handle emergencies like choking, drowning, epileptic fits, and basic CPR in infant and child. Being aware of the safety hazards around us will also help us take the necessary corrective actions and prevent such accidents from happening. 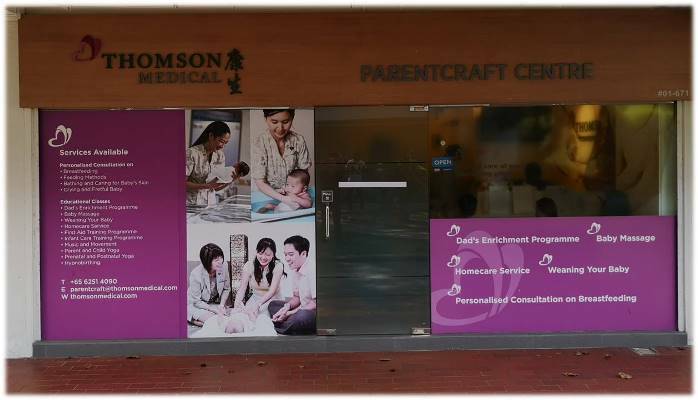 Thomson ParentCraft welcomes parents who need a one-to-one consultation on issues concerning breastfeeding, bottle-feeding, a crying and fretful baby, caring for baby’s skin etc. Please fill up and submit the form. We shall send you with the course schedule and applicable fees.